We’re now very close to the launch of the Samsung Galaxy S10 range, but at this rate there might not be many surprises, as the phones have been heavily leaked, and today several more sources have filled in some of the gaps in our knowledge. The bulk of today’s rumors come from Max Weinbach (a contributor to XDA Developers) on Twitter, who says among other things that the Samsung Galaxy S10 Lite will come with 4GB of RAM and 128GB of storage, and the standard Galaxy S10 will have 6GB of RAM and 128GB or 256GB of storage. The Samsung Galaxy S10 Plus meanwhile will apparently come in configurations with 6GB or 8GB of RAM and 128GB, 256GB or 512GB of storage. He also adds that the 5G model of the Galaxy S10 Plus will have a choice of 8GB or 12GB of RAM, and 256GB, 512GB or 1TB of storage. The foldable Samsung Galaxy X, which looks to be landing at the same event, supposedly has 12GB of RAM and 512GB or 1TB of storage, though Weinbach notes that he’s not 100% sure of the folding phone’s specs. Weinbach also has some information on the cameras, saying that all three phones (the S10 Lite, S10 and S10 Plus) have an ultra-wide 16MP f/1.9 lens with a 123-degree field of view but no optical image stabilization (OIS). Apparently they also have a 12MP standard lens with a variable aperture that can switch between f/1.5 and f/2.4. This one is said to have OIS. The Samsung Galaxy S10 Plus will additionally apparently have a 13MP f/2.4 telephoto lens with OIS and a 45 degree field of view. So in other words, both the S10 Lite and standard Galaxy S10 would have two lenses while the Galaxy S10 Plus would have three. Interestingly though, reliable leaker @UniverseIce slightly disagrees, saying that the standard S10 will also have three lenses. Back to Weinbach’s claims, he says that the S10’s camera will have both ‘Bright Night’ and portrait lighting. He also says that the phone will come with a pair of AKG earbuds, that it has the same speaker grille design as the Samsung Galaxy Note 9, and that its chin is slightly larger than the top and side bezels. Apparently the phones will also have a dual NPU (neural processing unit) and glossier bodies than the Samsung Galaxy S9 range. Both the Galaxy S10 and S10 Plus will apparently have in-screen ultrasonic fingerprint scanners, but the S10 Lite is said to have a side-mounted normal scanner, which we’ve heard before. Finally, the power button on the Galaxy S10 Plus is apparently way above the Bixby button, while the placement on the S10 and S10 Lite is supposedly similar to the Galaxy S9’s. S10 Lite or S10 E? In other more minor news we’ve heard from CompareRaja that the entry-level S10 will indeed be called the Galaxy S10 Lite, rather than the Samsung Galaxy S10 E as had recently been rumored. However, Evan Blass (another reliable leaker) has separately said that he too has heard the S10 E name, so we’re still not sure about the naming. The site also reiterates some previous rumors, saying that the S10 Lite will have a 3,100mAh battery, the Galaxy S10 will have a 3,500mAh one, and the Galaxy S10 Plus will have a 4,000mAh one. 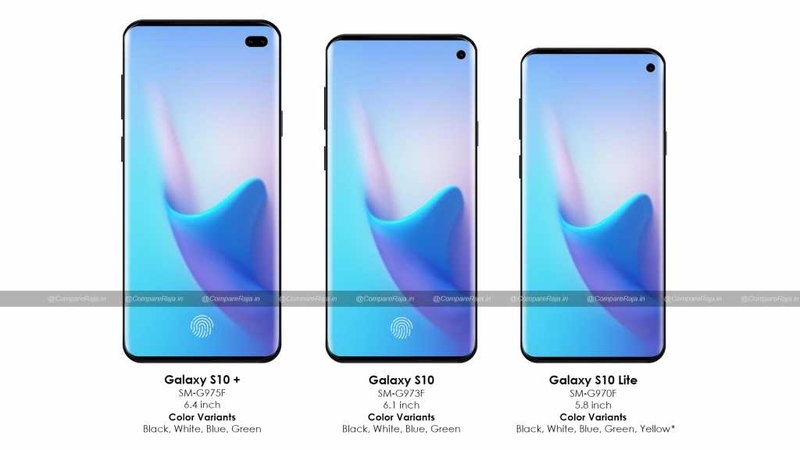 The range is said to come in black, white, blue and green, with the S10 Lite additionally getting a region-dependent yellow option. As ever, we’d take all of this with a pinch of salt, especially the information on camera lenses and the naming of the Galaxy S10 Lite, since there’s some disagreement there, but with the Samsung Galaxy S10 range set to land on February 20 we’ll know the truth very soon.